Set in the murky and messy intersection between politics, global finance and espionage, I was left feeling this should have been considerably more thrilling than it actually is. 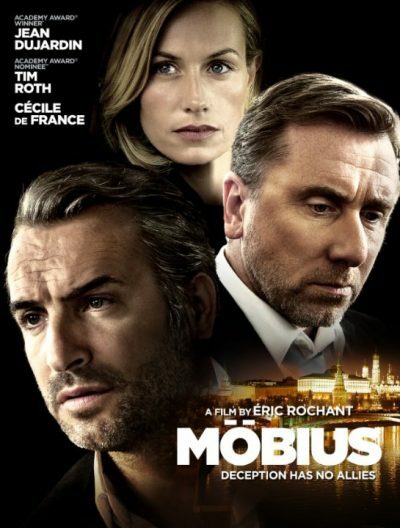 Financial wiz with a shady past, Alice Radmond (de France), is recruited by the Monaco police to help in their investigation of Russian oligarch Ivan Rostovsky (Roth). Except, it’s not the cops at all, but the Russian authorities who are seeking dirt on the influential businessman. Complicating matters, Radmond is already an asset of the CIA. Complicating matters further, her Russian handler, Gregory Lyubov (Dujardin) starts up a relationship with Radmond, and her American handlers want to use this to turn him into a double-agent. The ending wants to yank the carpet out from under the viewer, and make then re-evaluate everything that’s gone before. However, the execution to that point has been so pedestrian, that rather than a Usual Suspects “Ah-hah!”, it provokes not much more than a slight nod of acceptance. I understand that the underlying theme here – money laundering – is not exactly thrilling by nature. God knows, the training classes inflicted on me during my banking IT days were gnaw off your own leg to escape bad [and given the subsequent issues of HSBC, clearly were no more than a symbolic gesture!]. But the film gives you no reason to care about any of this. Why should we give a damn about Lyubov’s financial status? There’s never any sense of threat generated, and as a result, apathy descends. Then there’s the question of casting Roth, Sarf Lundin accent and all, as a Russian tycoon. Admittedly, the film says something about the character having been brought up in England, and he does bear some resemblance to Roman Abramovich, the owner of Chelsea. But, you couldn’t find any actual Russians for the lead roles, and have to use a Frenchman and a Brit? What I did quite like is the marginal competence depicted here. The intelligence community, particularly the CIA, are far from all-powerful, frequently screwing up in the execution of their plans, which seems entirely credible [especially as we approach the 15th anniversary of 9/11, an attack which I think should have been foreseen, if the pieces had only been put together]. The language switches at semi-random between English, French and Russian, which is a nice touch, yet also manages to be somewhat aggravating. The same is true for much of the movie, which feels like it should be considerably more effective than it is. It feels as if the director instructed everyone to be persistently low-key in their approach, reining in almost entirely all passion and intensity. That can’t help but rub off on the the audience: if the characters don’t appear to be invested in and care about their situation or each other, why should anyone else? Some nice French Riviera backdrops helped prevent me ever becoming disenchanted enough to start surfing Facebook, yet this wasn’t very much of an improvement on those money-laundering training videos, in terms of entertainment.